I am on the cusp of finishing the first volume of The Philokalia. One of the big concerns that will strike many a Protestant who comes across books such as The Philokalia or The Art of Prayer or the Desert Fathers and Mothers or Dionyius the Areopagite is an apparent lack of crucicentrism. 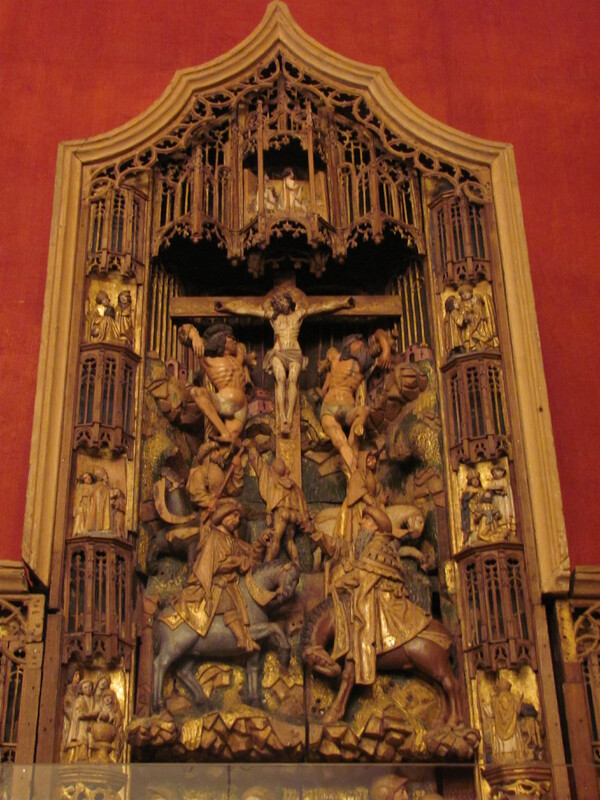 While few of us are not necessarily that excited by Gothic altarpieces, we have a devotion to Jesus that is focussed upon his atoning death and sacrificed that oned us to God. The first way to assuage any such concerns is to remind the person that anthologies such as The Philokalia or The Art of Prayer do not include everything written by the authors. Maximus the Confessor wrote a great many things not in The Philokalia. The second is to point out that there is a difference of genre here from what is being sought; this is not dogmatic theology, nor even devotion as understood in the later Middle Ages. It is about certain aspects of Christian praxis, namely how to achieve stillness (hesychia) and meet with the risen, ascended Christ here and now. The third is to check the index of The Philokalia, vol. 1, and see where/how the cross figures in the book. 30. The law of freedom teaches the whole truth. Many read about it in a theoretical way, but few really understand it, and these only in the degree to which they practise the commandments. 31. Do not seek the perfection of this law in human virtues, for it is not found perfect in them. Its perfection is hidden in the Cross of Christ. 2. Wishing to show that to fulfil every commandment is a duty, whereas sonship is a gift given to men through His own Blood, the Lord said: ‘When you have done all that is commanded, say: “We are useless servants: we have only done what was our duty”‘ (Luke 17:10). Thus the kingdom of heaven is not a reward for works, but a gift of grace prepared by the Master for his faithful servants. 20. If ‘Christ died on our account in accordance with the Scriptures’ (Rom. 5:8; 1 Cor. 15:3), and we do not ‘live for ourselves’, but ‘for Him who died and rose’ on our account (2 Cor. 5:15), it is clear that we are debtors to Christ to serve Him till our death. How then can we regard sonship as something which is our due? 21. Christ is Master by virtue of his own essence and Master by virtue of His incarnate life. For He crates man from nothing, and through His own Blood redeems him when dead in sin; and to those who believe in Him He has given His grace. 23. We who have received baptism offer good works, not by way of repayment, but to preserve the purity given to us. 26. While man can scarcely keep what belongs to him by nature, Christ gives the grace of sonship through the Cross. He encourages Nicolas to keep in mind ‘the great humiliation which the Lord took upon Himself in His ineffable love for us’ (p. 156 English). St Mark goes on to give a beautiful synopsis of the Gospel story from Incarnation to ascension. Consider Christ’s humiliation — and then endure your own suffering. The point of these texts is to encourage Christians in the path to righteousness, to give them practical advice about prayer and the spiritual life. It is to remind them that none of their good works are anything worth but, rather, the manifold and great mercies of God make them so. The Cross of Christ stands in ascetic theology as very briefly excerpted above in three ways, then. Christ has died for us and given us grace. This grace enables us to live holy lives. Christ has died for us; we should live holy lives out of gratitude. Christ has suffered and died; we should endure our sufferings with patience. There is not laying out in full of a theory of the atonement here, but that is not what St Mark is aiming at. He almost assumes such knowledge on the part of the reader from the start. So, this Good Friday, how will the Cross of Christ impact how you live? I invite you as you read these posts to read the corresponding sections of the Rule of St Benedict. I will be quoting throughout the translation of Carolinne M. White, The Rule of Benedict, from Penguin (I used the £2 Little Black Penguin, but there is also a full-size edition). My friend Andrew has digitised another English translation available at Project Gutenberg. The Prologue to the Rule of Benedict is not so much a setting out of what will follow as it is a call to wake up, although it does touch on one of the most important themes of the Rule, one that is distasteful to our modern ears: obedience. Let us begin with the wake-up call (avoiding Petra references). As the verse says (Ro. 13:12), “The night is far spent, and the day is at hand.” Or, as my mother felt the Lord say once, “Life is not a dress rehearsal for eternity.” What are we doing now about salvation? Christianity is not an exercise in passivity. It is a matter of finding the truth and living it. For Benedict, the truth is found in the Scriptures, it is found in Christ, it is found the writings of the Fathers. We cannot be slack or lazy or put off to tomorrow the holiness to which we are called today. Christians in many (all?) ages have been tempted in two ways: cheap grace or legalism. Sometimes (for example) I think it is easier to be a teetotaller or someone who drinks to excess than it is to drink in moderation. Benedict will read to many people like legalism, even though he is far more lenient than some of his contemporaries. And the thing that we will chafe under most is obedience. Very quickly, it is worth here reminding ourselves of the modern notion of freedom as the pure, unrestrained activity of the will of the human individual. Or nation-state, at a higher level. Anything that conflicts with my desires is seen as necessarily bad. This vision of freedom is in direct contrast with the pre-modern West, where true freedom was found by living according to your own nature, or the nature of the universe (Stoicism); it was found by seeking the summum bonum (Aristotle, Anselm, Aquinas), or the beautiful (Plato’s Symposium) and then living in accord with that. It is choosing to restrain our wills to something bigger and better than the fleeting pleasures of a moment. What we tend to consider ‘freedom’ today is really just slavery to the passions. We should instead seek to be freed from the passions, or seek to rule them and guide them in accordance with nature, reason, the greater good. The needs of the many outweigh the needs of the few — or the one (Spock, Star Trek II: The Wrath of Khan). If we do not control the passions, do not subvert them to the greater good, we are not free, for we cannot choose rightly. While many Christians would agree with all of this, there are still concerns about obedience as Benedict lays it out. The Benedictine monk is to give absolute obedience to the abbot. This, in fact, is common to many Late Antique ascetic/monastic texts, whether in Sinai with John Climacus, Egypt (Palestine?) with Mark the Monk, Luxeuil with Columbanus, Monte Cassino with Benedict. Our concern about giving any human such obedience is not ungrounded. We live in the age after Jonestown, after all. We have seen what personality cults can do in a less murder-suicide manner, anyway. Nevertheless, for Benedict, responding to the call to holiness starts with obedience. Here, in the Prologue, obedience is first and foremost to Christ. Let us keep that in our mind when we consider other parts of the Rule and the rest of obedience. Christ is the Good Shepherd, not the abbot. But our disordered wills should perhaps submit to the wisdom of our elders in the faith. Otherwise, is it not like undergraduates determining pedagogy, as though 18-22-year-olds know what’s best for them, how best to educate themselves? At the root of both ethics/morality and discipline lies the reality of God as creator and sustainer. He knows best because he is best. He is Aristotle’s summum bonum, as discussed by Anselm’s Monologion. Therefore, we willfully submit to God’s will and God’s commands in order to flourish. 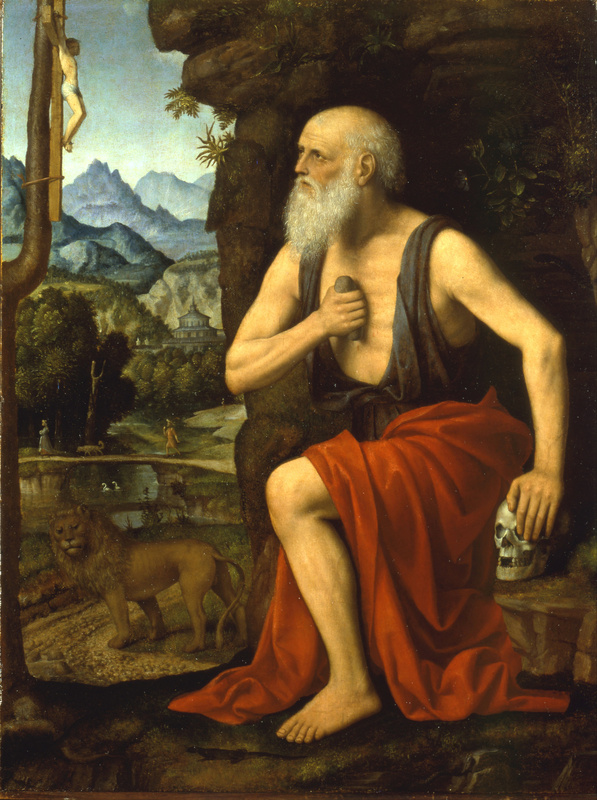 Our lives, as St Paul says, are not our own. We were bought at a price. Let us ever keep scriptural obedience in mind in our reading of Benedict. We find God’s commands in Scripture. We also, sometimes, add disciplines. There is an important difference between discipline and morality. Discipline is the voluntary activity in which we engage to grow spiritually, but it is, morally, optional. Ivo of Chartres makes this important distinction in the prologue to his canonical collection around 1100. Discipline is askesis, the word for training an athlete. We need to train ourselves for the fight for holiness in our lives, against the passions and the demons and the external temptations of life. And so, as we steer clear of the Scylla of cheap grace, which is what Benedict’s Prologue is calling us to do, we feel like perhaps we are veering into the Charybdis of legalism or what Presbyterians call ‘works righteousness’. But what about ‘work out your salvation with fear and trembling’ (Phil. 2:12)? The sheep and goats of Matthew 25? Faith without works is dead — the epistle James. Holiness is a calling that we pursue. God acts in us as we act for him. The ancient and medieval ascetics are thus helpful for us in our simultaneous fear of cheap grace and legalism. They sought to radically train themselves to live in holiness. Even if we are saved by grace, holiness usually seems to arrive after some effort. I saw this as an Anglican, thinking beyond the ancients to Jeremy Taylor’s Holy Living or William Law’s A Serious Call to a Devout and Holy Life. I’ve blogged on the latter before. Both of these writers, without denying the necessity of grace, believe in the disciplined life. One of the points made by Taylor, and reproduced as an appendix in Dallas Willard, The Spirit of the Disciplines, is the fact that specific disciplines are not necessary to all Christians — that each of us needs to train for holiness in the way that works for our soul. First of all, we know that God is the beginning, middle and end of everything good; and it is impossible for us to have faith in anything good or to carry it into effect except in Christ Jesus and the Holy Spirit. -‘On the Spiritual Law’, 2, in The Philokalia, Vol. 1, p. 110. In ‘No Righteousness by Works’, St Mark goes into this discussion more extensively. He also has high expectations of his ascetic readers. We have been called out of the darkness and into the light. We have been shown by the Scriptures what holiness looks like. Christ and the apostles fasted and prayed. The apostles searched the Scriptures. They performed acts of mercy. They called us all to obedience to God as well as mutual submission to one another. Countless sermons and Eastertide devotionals remind us of what Our Lord’s disciples must have felt this day. Bewilderment. Loss. Fear. Disillusionment. Suffering of an existential variety. The day before, Good Friday. One of the Holy Trinity suffered and died for us. Holy God, Holy Strong, Holy Immortal, Who was crucified for us, have mercy. 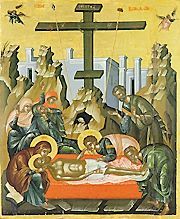 Christ rests in the tomb. Some days, it feels like maybe He stayed there — personal suffering blocking theological perspective. Illness of oneself or a loved one, poverty, bereavement, loss of employment, tenuous employment, tense work/family/household/school/church situations, mental illness. There are actually no easy answers for suffering. Brother Lawrence in The Practice of the Presence of God says that we should accept illness, in particular, as God’s will for us, that we may learn to live under His will. My friend with chronic illness found this singularly unhelpful. In God and Man, Met. Anthony Bloom says that as Christians, we must be ready to suffer. Indeed, he says that Christianity necessarily involves suffering. This is in stark contrast to what we usually think about religion. I remarked to a group of students recently that many people join different religions or ancient mysteries because they are promised happiness through religion — except, I said, by Met. Anthony. At the bottom of this article, I am posting a video interview with Met. Anthony from CBC back in what looks like the 1980s. I’m a bit surprised to find this interview coming from the Canadian Broadcasting Corporation, but I’ll take it! Anyway, in the interview, Met. Anthony believes that our suffering can be truly transformative and redemptive in our lives — if we suffer with love. Love is what makes all the difference for Met. Anthony, although he also believes that fortitude and endurance can make suffering good for us as well. This is in contrast to how most of us view our own sufferings and those of others today. It is, however, in keeping with the Eastern Orthodox tradition. St Mark the Monk (or ‘Ascetic’ or ‘Solitary’) wrote in the early to mid-400s, at a time when Nestorian and Pelagian ideas were hot topics. 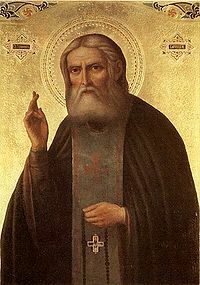 He is the next author in The Philokalia after St John Cassian on whom I blogged fairly extensively in February. I find St Mark hard to grasp at times, and I do not always agree with him. But he is worth wrestling with. 42. Afflictions bring blessing to man; self-esteem and sensual pleasure, evil. 43. He who suffers injustice escapes sin, finding help in proportion to his affliction. 65. To accept an affliction for God’s sake is a genuine act of holiness; for true love is tested by adversities. 66. Do not claim to have acquired virtue unless you have suffered affliction, for without affliction virtue has not been tested. 67. Consider the outcome of every involuntary affliction, and you will find it has been the destruction of sin. Numbers 65-67 resonate particularly with the teaching of Met. Anthony. I believe that part of what we see in these verses is a redirection of the heart. What matters is not, ultimately, blame, or origin of suffering. What matters is not its intensity. What matters is our response to it. This is part of the arguments found in Cassian’s Conferences, in fact; their philosophical roots are Stoicism. If suffering comes our way, it is best, ultimately, to respond with reality. I was going to say, ‘If suffering comes our way, do we blame God, or see how we can respond to suffering in faith and virtue?’ But, really, how many of us have reached such a state of purity of heart that such is even possible. The Psalms teach us to be real with God. The Psalms also push through disappointment, anger, frustration, grief, etc., directed towards God and draw us up into joy and glory. So, perhaps, we should certainly give God whatever true feelings we have in the moment. But maybe the reflective and meditative exercise on sufferings is to see how we can become more virtuous through them? Maybe we can use the things over which we have no control to better our lives and the lives of others in areas where we do have control? There are no quick, easy answers to suffering. But I think Met. Anthony Bloom of Sourozh is onto something. I’d certainly take his view on suffering over Joel Osteen any day. Lent starts in a week (unless you’re Eastern Orthodox, in which case it starts in five days). The question of Lenten discipline inevitably arises, whether simply in one’s own mind, or in conversation with friends. “What are you giving up for Lent?” everyone asks. Chocolate? Alcohol? R-rated films? Smoking? Coffee? Sweets? Meat? Sure. Any of these will do. The point of Lent is not the giving-up-of-things. The point of Lent is disciplina, the training/teaching of ourselves, the preparation of our spirits for the Great Feast of Easter — the Chief Feast of the Christian year. We want to draw nearer to God. So we fast or abstain or pray more or study a particular book of the Bible or another work of spiritual edification. I read James W. Kennedy, Holy Island: A Lenten Pilgrimage to Lindisfarne one year. Another year, it was Richard Foster, Celebration of Discipline. Once I read Elder Thaddeus of Vitovnica, Our Thoughts Determine Our Lives. My Lenten reading seems to have been as eclectic yet predictable as ever. One year I prayed BCP Compline every night. That was 2004. I fell in love with the BCP that year. Maybe this year you’ll choose to journey with us through the daily office over at The Witness Cloud. Even if you belong to a church that has canonical demands for Lenten discipline (that is, observant Roman Catholics and Eastern Orthodox), spiritual discipline — Lenten or otherwise — is not one-size-fits-all. I know one Cypriot Orthodox priest who gives up sweets for Lent because he does not eat a lot of meat, so the canonical discipline is not so demanding. Dallas Willard, The Spirit of the Disciplines, provides us with similar insights, in particular from the introduction to Jeremy Taylor’s Holy Living in Appendix I. What matters is not which discipline you take on in Lent. What matters is ordering our hearts and minds to the greater love of God and neighbour. So think carefully and prayerfully this next seven-day as to what you may do.